How Do I Invite Others To Join a Meeting? The Reports section of the website is a powerful tool that provides account owners and admins with various account, meeting, and webinar statistics to review how your organization is utilizing Zoom. Login to your Zoom Web Portal and navigate to Reports. Click the type of report that you would like to pull. You can also click the User Activity Reports tab to view additional types of reports. Daily: The Daily report shows the account-wide usage for each day in a given month. It lists the new users, meetings, participants, and meeting minutes. This report encompasses every meeting hosted by a user under the account. Active Hosts: The Active Hosts report pulls a list of meetings, participants, and meeting minutes for a specific time range, up to one month. Inactive Hosts: The Inactive Hosts report pulls a list of users who were not active during a specific period of time. Upcoming Events: The Upcoming Events report will list all upcoming meetings and webinars for the selected time period. You can also search by host's email address or name. Check the box to include events with no fixed time. 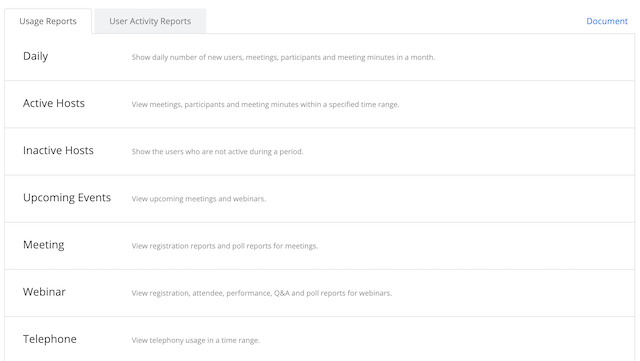 Meeting: The Meetings report option allows you to search for Registration Reports and Poll Reports for a meeting. Select the type of report you need, search by a date range to find the meeting, and then choose Generate for the report. Webinar: The Webinar report option allows you to search for Registration, Attendee, Performance, Q&A, and Poll Reports for webinars. Select the type of report you need, search by date range to locate the webinar and then generate the report. Telephone: The Telephone report allows you to view who dialed into meetings via phone and which number they dialed into, how much was charged to your Zoom account, and other details. Cloud Recording: The Cloud Recording report allows you to search by date range to view cloud recording usage over a specific time period, including which meetings were recorded and which files were generated. Remote Support: The Remote Support report shows usage of the remote support feature over the designated time period, including the meeting ID, who was providing remote support, and who was receiving remote support. Operation Logs: The Operations Logs are available under the User Activity Reports tab. The Operations Logs allow you to audit admin and user activity, such as adding a new user, changing account settings, and deleting recordings. Sign In/Sign Out: Sign In/Sign Out Reports are available under the User Activity Reports tab. The Sign In/Sign Out Reports allow you to see who signed in or out, their IP address, what platform they were on, and their version number if applicable.